Here's the CIAProChef printable recipe and instructional online video for the Tunisian Spiced Chicken Skewers with Pomegranate Dressing for which I won First Prize in the Culinary Institute of America Challenge. I made this during February with some help from one of my 12 year-old triplets who is an aspiring cook. 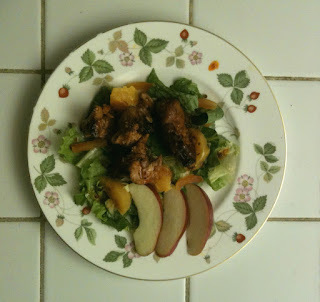 We prepared the chicken as directed, substituting dried apricots for dates to give this dish even more color. Thanks to the Canola Oil with the skinned chicken breasts we used, it was very healthy and low in cholesterol, not to mention visually elegant and appetizing. Most important it was nutritious and my entire family, which includes me, hubbie, and our triplets and big brother--who are only a year apart in age--absolutely loved the jewel-like presentation. Ever since I served this to my family they keep asking when I'm going to make it again as well as try some other recipes using Canola Oil. I keep telling them I will prepare this dish again soon, as well as trying some others. Don't worry, MommyBlogExpert readers, I will be testing out some more main dishes and a dessert or two using Canola Oil and when I do, I promise to post the recipes, results, and pictures to share with you on this blog. Meanwhile, I encourage you to educate yourself about this wonderful, relatively new cooking oil. View and request the range of free Canola Oil information that is available to be mailed to you here . FTC Disclosure: This post discusses my entry into the CanolaInfo & CIAProChef Challenge for which I have won First Place prize of an All-Clad Gourmet Accessories Panini Pan with Press. However, for writing specific blogpost recapping this contest entry, I have not received any products, payment, or other compensation associated with any of the companies or products mentioned. See complete FTC Disclosure information that appears at the bottom of MommyBlogExpert's main page and at the bottom of every individual post on this blog, including this one.